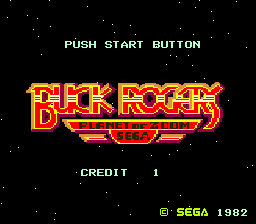 Buck Rogers: Planet of Zoom is an early arcade game developed by Sega for VCO Object hardware. It uses the Buck Rogers comic book/television license, and stands as one of Sega's first licensed video games, along with Star Trek: Strategic Operations Simulator, both debuting in 1982. The game is adapted from the earlier Zoom 909, a largely identical game seen predominantly in Japan. Buck Rogers: Planet of Zoom is one of the earliest examples of a "rail" shoot-'em-up game. Gameplay is played in a pseudo-3D third-person perspective, with enemies and obstacles moving towards the camera. 2D sprites are scaled in real-time to give an illusion of depth - technology which would serve as a basis for a plethora of arcade games produced by Sega in the 1980s. In its original arcade form, each "round" is divided into 8 "sectors", each with slightly different aesthetics and gameplay. When a round is complete, the game loops, becoming more challenging in the process. Buck Rogers: Planet of Zoom was brought to a wide variety of home consoles and computers between 1982 and 1985, including the Apple II, Atari 2600, Atari 5200, Atari 8-bit family, ColecoVision, Commodore 64, IBM PC (as a PC booter), TI-99/4A, VIC-20 and ZX Spectrum, each suffering slightly due to weaker hardware. Due to odd circumstances, the MSX received two ports of the game by different developers and publishers, one under the Buck Rogers: Planet of Zoom name, and another as Zoom 909. Most of the home conversions opt only use two different types of levels - a "ground" level which acts as a hybrid between the arcade sectors 3 and 7, and a "space" level which plays like sector 2 (albeit often without a background). Only the ColecoVision version attempts to replicate the arcade game's content in full - it still drops some sectors (there are six in total, and called "sections" in this port), but by featuring tunnels, it remains the closest home conversion of the game (though home ports of Zoom 909 for the MSX and SG-1000 also feature tunnels). Main article: Buck Rogers: Planet of Zoom/Magazine articles. Main article: Buck Rogers: Planet of Zoom/Promotional material.